Epsom salt is a naturally occurring pure mineral compound of magnesium and sulfate. Epsom salt has numerous health benefits as well as many beauty, household and gardening-related uses. Studies have shown that magnesium and sulfate are both readily absorbed through the skin, making epsom salt baths an easy and ideal way to enjoy the amazing health benefits. Magnesium plays a number of roles in the body including regulating the activity of over 325 enzymes, reducing inflammation, helping muscle and nerve function and helping to prevent artery hardening. Sulfates help improve the absorption of nutrients, flush toxins and help ease migraine headaches. Stress drains the body of magnesium and increases levels of adrenaline. When dissolved in warm water, epsom salt is absorbed through the skin and replenishes the level of magnesium in the body. The magnesium helps to produce serotonin, a mood-elevating chemical within the brain that creates a feeling of calm and relaxation. Magnesium also increases energy and stamina by encouraging the production of ATP (adenosine triphosphate), the energy packets made in the cells. Bathing with epsom salt at least three times a week may help you to look better, feel better and gain more energy. Magnesium ions also relax and reduce irritability by lowering the effects of adrenaline. They create a relaxed feeling, improve sleep and concentration, and help muscles and nerves to function properly. An epsom salt bath is known to ease pain and relieve inflammation, making it beneficial in the treatment of sore muscles, bronchial asthma and migraine headaches. In addition, it has been known to heal cuts and reduce soreness from childbirth. Mix a thick paste of Epsom salt with hot water and apply to get soothing comfort. Soak your aching, tired feet in a tub of water with half a cup of epsom salt. Epsom salt softens skin and neutralizes foot odor. Studies show that epsom salt can help regulate electrolytes in your body, ensuring proper functioning of the muscles, nerves and enzymes. Magnesium is also known to be critical in the proper use of calcium, which serves as a main conductor of the electric impulses in your body. Epsom salt is believed to improve heart health and help prevent heart disease and strokes by improving blood circulation, protecting the elasticity of arteries, preventing blood clots and reducing the risk of sudden heart attack deaths. Proper magnesium and sulfate levels increase the effectiveness of insulin in the body, helping to lower the risk or severity of diabetes. Epsom salt can be used to treat constipation. 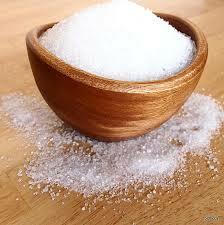 Taken internally, epsom salt acts as a detoxifying agent for colon cleansing. The salt acts like a laxative by increasing water in the intestines and can bring about temporary relief from constipation. However, it is strictly warned that epsom salts should not be used to relieve constipation without the consultation of a physician. Measure out four ounces of cold water. Dissolve one teaspoon of the epsom salt into the water by mixing thoroughly. Add a small amount of lemon juice to the solution. This will not change its effectiveness and can help improve the taste of the drink. Consume the entire solution in one sitting. If needed, you can repeat the dose after four to six hours. It is recommended that you use epsom salt only twice in a 24-hour period to treat constipation. If you find one teaspoon is ineffective, you can use as much as two teaspoons of epsom salt per dose. The sulfates in epsom salt help flush toxins and heavy metals from the cells, easing muscle pain and helping the body to eliminate harmful substances. Your skin is a highly porous membrane and adding the right minerals to your bathwater triggers a process called reverse osmosis, which actually pulls salt out of your body, and harmful toxins along with it. For a detoxifying bath, at least once weekly add two cups of epsom salt to the water in a bathtub and soak for 10 minutes. To relieve stress – add 2 cups epsom salt to a warm bath and soak for at least 12 minutes. To moisturize your skin, add 1/2 cup olive oil, coconut oil, or baby oil. Do not use soap as it will interfere with the action of the salts. Try to rest for about two hours afterwards. If you have arthritic joints move them as much as possible after an epsom salt bath to prevent congestion in the joints. As a foot bath – add 1/2 cup of epsom salt to a basin of warm water. Relax and soak feet for 20 minutes. Rub away any calluses using a pumice stone. Dry feet, then add two drops of peppermint essential oil to your favorite natural moisturizer. If you are pregnant or have any health concerns, check with your doctor before using Epsom salts. Athlete’s Foot – Soak feet in an epsom salt bath to help relieve the symptoms of Athlete’s Foot. Remove splinters – Soak affected skin area in an epsom salt bath to draw out the splinter. Treat toenail fungus – Soak your affected toes in hot water mixed with a handful of epsom salt three times a day. Soothe sprains and bruises – Add 2 cups epsom salt to a warm bath and soak to reduce the pain and swelling of sprains and bruises. Ease discomfort of Gout – Add 2-3 teaspoons of epsom salts into a basin and immerse the affected foot/joint. The water should be as hot as it is comfortable. Soak for about 30 minutes. Hair volumizer – Combine equal parts deep conditioner and epsom salt and warm water in a pan. Work the warm mixture through your hair and leave on for 20 minutes. Rinse thoroughly. Clean bathroom tiles – Mix equal parts epsom salt and liquid dish detergent and use as a scrub on bathroom tile. Prevent slugs – Sprinkle epsom salt on or near interior entry points to prevent slugs. As a hand wash – Mix epsom salt with baby oil and keep by the sink for an effective hand wash.
Fertilize your houseplants – Most plants need nutrients like magnesium and sulfur to stay in good health and epsom salt makes the primary nutrients in most plant foods (nitrogen, phosphorus, potassium) more effective. Sprinkle epsom salt once weekly to help nourish your houseplants, flowers and vegetables. Keep your lawn green – Magnesium sulfate crystals, when added to the soil, provide vital nutrients that help prevent yellowing leaves and the loss of green color (magnesium is an essential element in the chlorophyll molecule) in plants. Add 2 tablespoons of epsom salt to a gallon of water and sprinkle on your lawn to keep the grass healthy and green. Very nice blokg post. I absolutely love this website.